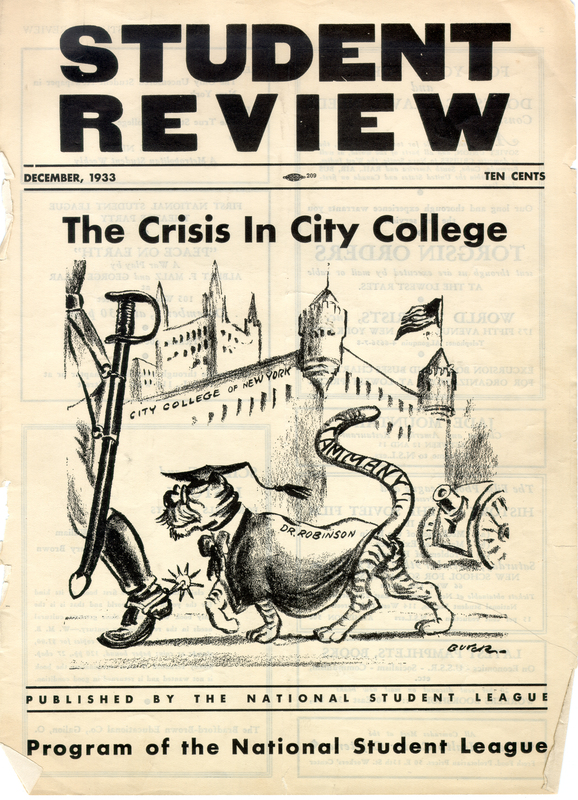 On this cover of the December 1933 edition of the National Student League's Student Review, CCNY President Robinson is depicted in full academic regalia as a cat, following in step behind a German military officer. Robinson's tail, meanwhile, is wagged by Tammany Hall, New York’s corrupt Democratic political machine. During his time at City College, Robinson drew extraordinary criticism from the left, particularly because of his repeated attempts to stifle free expression on campus. In May 1933, Robinson issued suspensions to a number of students, clubs, and campus publications following an anti-war/anti-ROTC rally in which he was alleged to have struck multiple students with his umbrella prior to his calling for police presence on campus. Cite This document | National Student League, “"The Crisis in City College",” CUNY Digital History Archive, accessed April 19, 2019, http://cdha.cuny.edu/items/show/3602.